The LARISSA Glaciology Team made its way back to the RV Nathaniel B. Palmer, in two unusual leaps. After getting picked up from Scar Inlet, we landed in Rothera Station, in the southern end of the Peninsula. We knew that if we wanted to get anything further done, we needed to get back aboard the ship. We had installed everything we had brought on Flask Glacier and Scar Inlet. We still needed to fix the SCAR inlet Web cam, and install a seismic listening station for glacier calving, and the ridge-top high-resolution AMIGOS camera. And time was running out: it was now February 17, and the Palmer would head north no later than the 26th. The team saw these crabeater seals during a boat ride near Rothera Station. As usual, the staff at Rothera were amazingly generous, taking us on an evening boat tour of some nearby islands while we waited for good weather for the next step. The boat ride was spectacular. Every shoal and beach teemed with wildlife. The next day was February 18, my birthday. Not a birthday present in sight, but I thought if we could get back to the ship, well, I’d take it as a sign from The Big Guy that I was doing okay by him (or her). That morning, the Twin Otter pilot gave us some cause for hope. His plan was to fly us to Palmer Station, the U.S. base, and have us wait there for a helo pick-up from the ship. The only trick was the runway at Palmer, set on a small ice cap behind the base. The ice has been badly eroded by the warming climate in recent years. It has rarely been used since 1990, and in fact the only landing in years was a medical evacuation in 2009. I was thinking how ironic it would be if I were the first casualty of Antarctic global warming. We flew between the bases (song: “The Blue Danube“) over the icebound landscape. Though every glance out the window was a masterpiece of landscape art, we at this point were able to read or nap as the dramatic sculpted architecture of the continent rolled beneath us. A crowd from the station had gathered, taking bets no doubt on whether or not we would survive. But they picked the wrong pilot to mess with. Richie circled once, and then slapped the plane down on the uppermost third of the bobsled run—I mean runway—and then threw the prop into reverse (Amazing fact: on a taxi-way, Twin Otters can actually back up under their own power). We bounced to a stop, not quite crossing the “6” on the doom countdown. The Palmer people (total population 38) were really welcoming. But I was shocked when Ronald pointed out a “Happy Birthday” banner in the galley. As it happened, February 18 was also the birthday for the Palmer Station chef, Staci, and the back-up chef, Diane, had gone all out for a celebration dinner and cake. All I had to do was shout “and Ted!” at the right moment in the birthday song. We had a fun night at the Palmer bar and hot tub. The team caught a ride from Palmer Station back to the the N.B. Palmer aboard the research vessel Lawrence M. Gould. 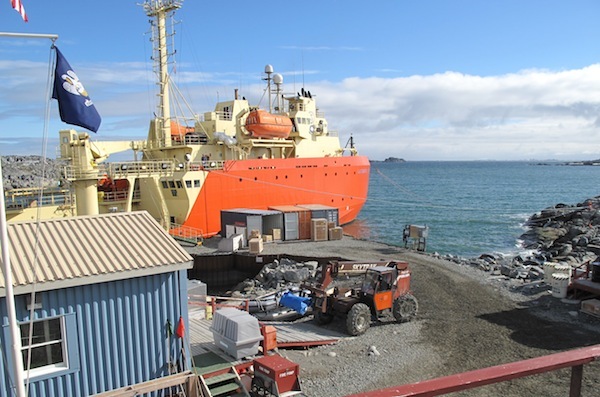 At Palmer Station, we noticed a large orange ship parked in front of the base. This was the RV Lawrence M. Gould, the other major U.S. polar research vessel, used mostly for oceanography around the continent. We learned that the ship was basically on stand-by for an entire month with little to do. We hatched a plan. We pulled away from the pier on the afternoon of February 20th, with a thousand pounds of gear strapped to the deck of our new water-taxi, the Gould. Officially, the Gould was out to replenish its water tanks (it desalinates the sea-water) and pick up some devices for sediment studies from the Palmer. But for the five us, it was one fine ride. This was my third birthday in Antarctica. So I guess I’m 3 in Antarctica years. Looking at the photo on our way out of Palmer, Martin informed me that Antarctica years seem to be a bit more taxing than even dog years. But as the two ships met up, at sunset in a coastal fjord, it seemed as if things were proceeding nicely for this toddler. 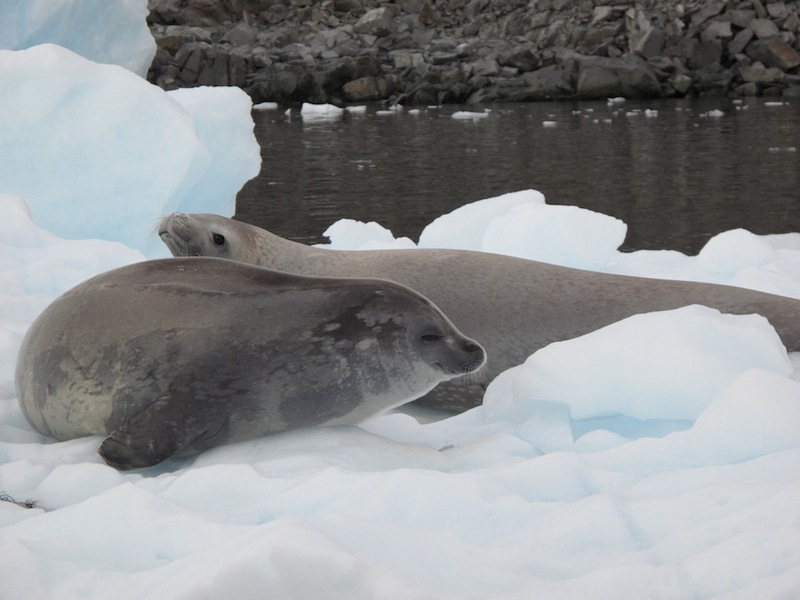 During a boat ride near Rothera Station, the team saw these crabeater seals. Erin looks her best in a neoprene immersion suit. Martin Truffer hams it up on a boat ride near Rothera Station. Ted was surprised to find a “Happy Birthday” banner celebrating his arrival to Palmer Station. The Palmer Station crew gathers for dinner in the galley. Palmer Station, a U.S. Antarctic station, currently houses 38 people. The runway at Palmer Station is now rarely used because it has cracked and sloped in warm temperatures. The research vessel Lawrence M. Gould met up with the N. B. Palmer in a coastal fjord.